Vampire: The Dark Ages takes you to the nights before the Camarilla, when kine truly had reason to be afraid of the dark. The vampires of this bygone age ride the dark as lords, play their games with the crowned heads of Europe, and travel to the mysterious lands of the East as they wafe their ages-old war. Come share in the rich terror and heady thrill of the 12th century. Learn what it means to be one of the Lords of the Long Night. 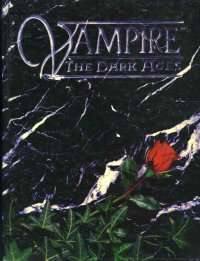 Vampire: The Dark Ages includes everything necessary for playing the Damned of the Middle Ages, allowing characters to experience the events that have influenced our age. Witness the growth of the new Tremere clan and the birth of the Anarch Movement. Battle hunters who wield the power of Faith, and savage Lupines whose control of the countryside is as total as the Cainites' control of the cities. Glory and terror await in the shadows of the past... but the darkness that you need fear most is the darkness within.